JLJ Plain Jane™ Soaps - same great soap, plain brown wrapper for only $5.50 a bar! Sometimes you just need the soap, so why pay for the extra packaging? Many of our customers order their favorite Just Like Jane soaps and don't plan to use them as gifts; or they'd like to package our handmade natural soaps in their own way. It seems a shame to pay for—then throw away—beautiful packaging, doesn't it? 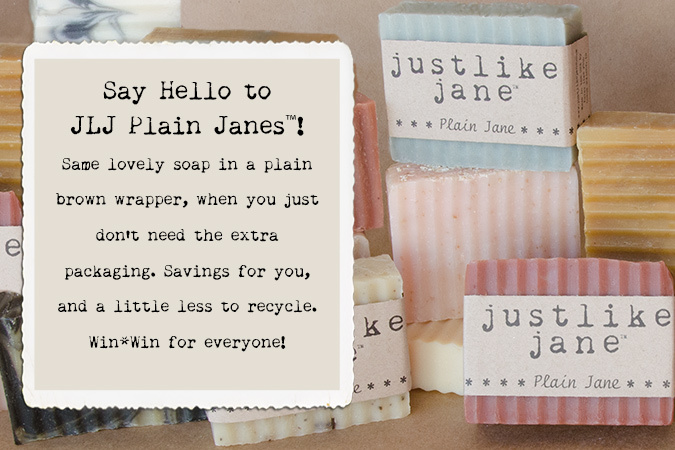 So we've introduced JLJ Plain Jane™ soaps at a cost savings to you! JLJ Plain Jane™ soaps come wrapped with a simple kraft paper band. Ingredients listing can be found on our website, on each soap's product page. How to order a JLJ Plain Jane™: As you view a product page, you'll notice that you have the option to enter a quantity and choose a "Vintage Jane" or a "Plain Jane" as a packaging option. The price listed by default is the normal Vintage Jane price of $7.00. Choosing "Plain Jane" will change the bar price to $5.50 each. After adding the Plain Janes™ to your cart, you can go back and add Vintage Janes if you so choose. If you'd like your soap packaged in our traditional corrugated pillow box with a vintage photo and twill tape, be sure to choose the default "Vintage Jane" option which prices bars at the normal rate of $7.00 per bar. Edit (10/13/2014): We no longer offer Soap Samplers...it was impossible to maintain distinct fragrances in a mixed package.